West Windsor, N.J. – Something familiar, something peculiar, something for everyone, a comedy tonight! Mercer County Community College's (MCCC) Kelsey Theatre kicks off its 2013-14 season with a trip back to Roman times when PinnWorth Productions presents “A Funny Thing Happened on the Way to the Forum” Sept. 6 to 15. This high energy classic starts off a colorful season of 22 full-length dramas and musical productions, along with eight shows for the younger set through the Kelsey Kids Series, performed by traveling professional troupes and local companies. View the brochure here. Kelsey Theatre is conveniently located on the college's West Windsor campus, 1200 Old Trenton Road. Discounted series packages are on sale now; subscribers receive over 45 percent off regular ticket prices. Subscriptions are also available for the Kelsey Kids Series. Current subscribers must renew by August 10 to receive priority seating. New subscriber orders will be filled after Aug. 10. Tickets for all single shows go on sale Aug. 20. Preparing for a new season of theater magic! Pictured back row from left, Kelsey Theatre Artistic Director M. Kitty Getlik, Box Office staff members Diana Maurer and Lott Pittman, Technical Coordinator Kate Pinner and House Manager Marc Flicker; front row from left, Education Programs Assistant Tracy Antozzeski; Box Office staff member Monica Retana, Administrative Assistant Amy Bessellieu, and Technical Assistant Dan Spalluto. Next up after “A Funny Thing Happened” is The Yardley Players' “A Flea in Her Ear” Sept. 20-29, a wild and wacky version of the Georges Feydeau comedy. The excitement continues with “Big River – The Adventures of Huckleberry Finn,” a family musical presented by The Pennington Players Oct. 4-13. The emotionally charged “Laramie Project – A Staged Reading,” presented by The James Tolin Memorial Fund, follows on Oct. 6. Just in time for Halloween is Pierrot Productions' "TBA, The Horror Musical" Oct. 18-27. It's a show that so recently left Broadway, the blood hasn't had time to dry; let's just say it's based on the novel by the King of Horror. Another staged reading follows with the Henrik Ibsen masterwork “Rosmersholm,” presented by the MCCC Academic Theatre Company and Professor Emeritus Mel Leipzig for one performance only on Oct. 24. From Nov. 1-10, Playful Theatre Productions presents “Working,” a celebration of the lives of everyday people featuring 26 songs by all-star composers. 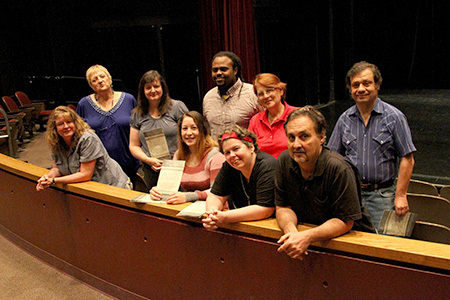 In the Studio Theatre Nov. 8-10 is "Mad Forest," presented by MCCC Theatre students. Next up are three weekends of the Monty Python comedy fest that is “Spamalot,” brought to you by the award-winning Maurer Productions OnStage Nov. 15-Dec. 1. Family events in December will add to holiday merriment. Children and their grown-ups will enjoy “Annie the Movie Sing-Along” Dec. 13-14, followed by the Nutcracker-inspired Latin and Spanish dance spectacular “El Sueno,” presented by the Alborada Spanish Dance Theatre Dec. 15. On to a new year as PinnWorth Productions returns to the stage Jan. 10-19 with “Love! Valour! Compassion,” a story of eight friends based on Terrence McNally’s Tony-Award winning story. M&M Stage pushes the envelope with “The Actor’s Nightmare and A Night in the Theatre” Jan. 24-26. It’s Christopher Durang’s hilarious parody of Absurdist Theater – and theater itself! More hilarity hits the stage with Pierrot Productions’ “The 39 Steps,” a Hitchcockian spy thriller played mainly for laughs Jan. 31 to Feb. 9. Audiences can prepare to rock on with the Reock & Roll Revue, which returns to Kelsey Theatre to perform “Eric Clapton – Journeyman,” considered by many to be Clapton’s best album, Feb. 15 and 16. Next up is a different take on the musical life, as The Pennington Players performs the play “Master Class,” a look at the artistic heights and emotional depths of opera great Maria Callas Feb. 21-March 2. The focus shifts to dance as the Mercer Dance Ensemble performs “Something for Everyone” May 10-11. Featuring Dance majors, community dancers and alumni from the MCCC Dance program, the company combines lyrical movement with impressionistic storytelling for all to enjoy. Two more winning musicals come to Kelsey Theatre in May. Pierrot Productions performs “The Great American Trailer Park Musical,” a redneck romp through Central Florida in the 1980s, May 16-25. “Shrek, the Musical,” about everyone’s favorite ogre, his feisty princess and a hilarious donkey, is brought to the Kelsey stage by Maurer Productions May 30-June 8. The full-length season closes out on a strong note as Shakespeare ’70 presents “Much Ado About Nothing,” considered one of the bard’s best comedies, June 13-22. Featuring classic fairytales and stage adaptations of famous children’s books, the Kelsey Kids Series kicks off its season with Theatre IV’s adaptation of “The Velveteen Rabbit” Oct. 19, a Margery Williams tale of friendship and unconditional love that never grows old. The charming tale of “Heidi” follows on Nov. 9, presented by Kaleidoscope Theatre. Kelsey Theatre celebrates the holiday season with two annual children's favorites:’Twas the Night Before Christmas,” presented by The Kelsey Players Dec. 6-8, and “The Nutcracker,” presented by the New Jersey Youth Ballet Dec. 20-22. Theatreworks/USA and Two Beans start off the new year Jan. 11 with “Alexander and the Terrible, Horrible, No Good, Very Bad Day,” the hilarious musical adaptation of Judith Viorst’s well-known children’s book. Another award-winning adaptation comes to life from ArtsPower, as they present their newest musical, “The Monster Who Ate My Peas,” Feb. 8. “Stuart Little” mixes actors and child-size puppets to tell the tale of the little mouse that could in Theatre IV’s magical adaptation April 5. The season closes with “The Emperor’s New Clothes,” presented by Kaleidoscope Theatre May 17. Ticket prices for full-length musicals are $20 for adults, $18 for seniors, and $16 for students/children. Prices for non-musicals are $18 for adults, $16 for seniors, and $14 for students/children. Special events are $20 for all. Shows in the Kelsey Kids Series are $10 for children and seniors, and $12 for adults. Discounted subscriber packages include premium seating, exchanges for performances of the same show, special "add-a-show" rates, and advance sales of single tickets. Group discounts are also available. To purchase a subscriber series or for tickets to individual shows, call the Kelsey Theatre Box Office at 609-570-3333. Online purchases will be available Aug. 20 at www.kelseytheatre.net. Patrons may also purchase tickets by mail with checks payable to MCCC/Kelsey Theatre, P.O. Box 17202, Trenton NJ 08690, or by ordering in person at the Box Office. Box Office hours are Monday through Friday, 9 a.m. to noon; and one hour before show time. Gift certificates are available in any amount. To request a print copy of the 2013-14 season brochure, email kelsey@mccc.edu or call the Box Office. Kelsey Theatre has open auditions for many of its productions and welcomes assistance from community volunteers to usher and work behind the scenes. The theater gratefully accepts donations. Call 609-570-3581 or visit the website for more information. The theater is wheelchair accessible and has secure lighted parking. Funding for performances is made possible in part by the Mercer County Cultural and Heritage Commission through funding from the Mercer County Board of Chosen Freeholders and the New Jersey State Council on the Arts/Department of State, a partner agency of the National Endowment of the Arts.